1. Place the glass snifters in a row in front of you. 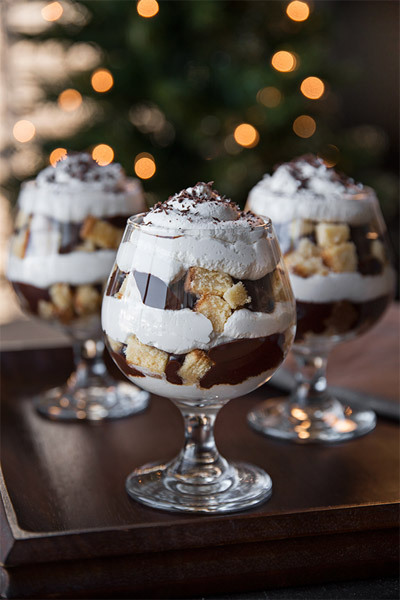 To the bottom of each glass, put in 2 tablespoons of the whipped cream as a base. 2. Add in a heaping ¼ cup of the cube pound cake, and drizzle over the cake 1 ½ teaspoons of almonds. 3. Drizzle in 2-3 tablespoons of chocolate ganache sauce over the cube cake, and then put in 3 tablespoons of whipped cream. 4. Repeat the process with another layer of cake, almonds and chocolate ganache sauce, and finish with a generous amount of whipped cream. 5. Grate some chocolate over the top for garnish, and lightly sprinkle with silver or gold edible sprinkles; chill until ready to serve. 1. Place all ingredients with the semi-sweet chocolate into a saucepan or small pot, and stir to combine. 2. Set the saucepan/pot over medium heat, and stirring with a rubber spatula to keep the chocolate from scorching to the bottom, bring the mixture to a gentle simmer until all the ingredients are melted and well-blended. 3. Off the heat, add in the small pinch of salt and the butter, and stir to combine until the butter is completely melted and blended in. 4. Strain the chocolate sauce into a measuring cup and allow it to cool at room temperature until slightly thickened. 1. Add the whipping cream into the bowl and begin to whip the cream on medium-high. Once the cream begins to thicken, sprinkle in the powdered sugar, and continue to whip for another 15-30 seconds or so, until further thickened. 2. Add in the almond extract and the almond liquor, and finish whipping until stiff. 3. Place the whipped cream into a piping bag fitted with a tip, or a large ziplock bag with the corner cut off, and keep in fridge until ready to use.